Rudyard Kipling wasn’t perhaps a great poet. Indeed, I believe one sage critic of his poems once said, “Kipling occasionally stumbles upon poetry.” or some such witty quip. 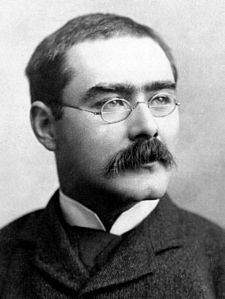 Kipling was born at the height of the British Empire, and remained an unapologetic imperialist throughout his lifetime. He is vilified even today as a racist, a white supremacist, a war monger, and even a fascist. Kipling’s own words lend credence to these accusations, such as his 1899 poem “The White Man’s Burden,” encouraging the USA during the Spanish American War to follow Britain’s lead in subjugating native peoples worldwide. Kipling was indeed a realist. He recognized the differences among the races. He acknowledged that throughout history, various people groups have subjugated other people groups around the world, as they continue to do today. Kipling was perhaps naive in his sincere belief that such subjugation actually benefited the conquered peoples – leastwise in the case of European colonialism – by bringing them what he considered a superior civilization marked by technological progress and constitutional democracy, regardless of whether the subdued people actually wanted these “advances.” Yet I don’t think it could be said that Kipling viewed other races as inherently inferior in the eyes of God, The closing words of “Gunga Din” testify to this. But the point of this BriRant isn’t to support or condemn Kipling’s political and sociological leanings. Kipling is worth reading because his poems are often tender and profound, like his famous “If—.” Some of them are also truly prophetic. My favorite of his poems by far – “The City of Brass” – was published in 1909 as the twilight loomed on his beloved British Empire upon which it had been said the sun never set. Over a century later, how ominous these words sound for the American Empire, which was in its infancy when the poem was first published. All empires crumble and collapse, usually through corruption from within. Kipling the realist understood that as well. I am sharing the full text of the poem here rather than just a link, because all of the online resources I have found contain a number of despicable transcription errors which destroy not only the meter and the rhyme, but the very meaning of the words. How can one forge a sward, pray tell? The wellsprings of Wisdom and Strength which are Faith and Endeavour. And the heart of a beast in the place of a man’s heart was given. . . .
Out of the sea rose a sign – out of Heaven a terror. A host had prepared their destruction, but still they denied it. But the Sword that was forged while they lied did not heed their denial. It drove home, and no time was allowed to the crowd that was driven. The preposterous-minded were cowed – they thought time would be given. It was decreed their own deed, and not chance, should undo them. The tares they had laughingly sown were ripe to the reaping. The trust they had leagued to disown was removed from their keeping. And it passed from the roll of the Nations in headlong surrender! Indeed, it seems that most of the members of our society now have “the heart of a beast” in the place of men’s hearts. As a society, we have indeed ascribed “all dominion to man,” and “given to numbers the Name of the Wisdom unerring.” Having turned our backs on God as a society, is it any wonder that God has left us to stew in our own juices? The signs of the coming of the host prepared for our destruction are all around. But perhaps most frightening of all is that most of those who recognize the coming onslaught and imminent collapse of our civilization remain silent, and even complicit in the abandonment of our principles, just as the Viceroys in this poem did, out of fear that by rocking the boat they will lose their own security – not recognizing that it is only an illusion created to lull us into complacency.